Storing food is one of the best ways you can be prepared. The best prepper food storage containers are the ones that preppers have been using for decades and are tried and true. Some have been around for centuries and others only a few decades. 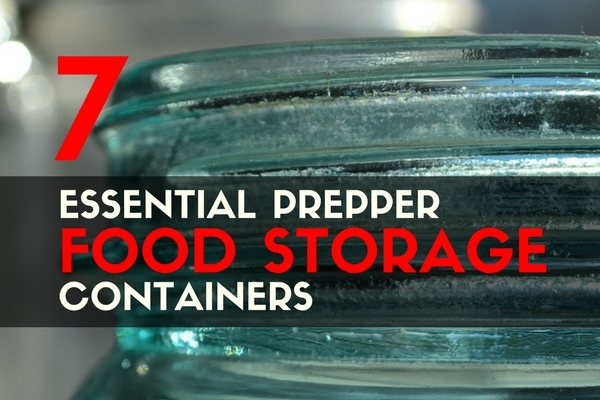 Storing food has always been one of the cornerstones of prepping and preparedness. As supply chains become more and more reliant on ‘just in time’ delivery there are less resources available to help when disasters or catastrophes strike. When this happens, food supplies can easily be disrupted and leave a lot of people hungry and looking for food. Keeping food stored is one of the most cost-effective ways to be prepared for these events, and having the proper food storage containers can ensure your success and survival. Whether you are increasing your pantry size or starting a long term food storage supply, the type of prepper food storage containers you use can make all the difference. Temperature Management: Keeping your food storage cool is a key requirement for helping it last a long time. 60 degrees Fahrenheit is a good target for a pantry. Pest Control: Keeping bugs and rodents out is no joke. Choosing containers that are more difficult for them to infiltrate should be a high priority. Light Blocking: When exposed to light, food can break down. Blocking light from getting to whatever you are storing can only help. Air Tight (Humidity and Oxygen): The most important part of a storage container is to be air tight. Excessive humidity and oxygen are both enemies of well preserved food. Storable: Choosing a storage solution that is stackable is best. Many containers that are stackable still have stack height limits, which will require more shelf space when you store them. Having containers that do not stack make you lose some storage efficiency too. If you can find food storage containers that meet all of these requirements then you will be off to a good start of preserving your food for the maximum time possible. The food you store is only as good as the food storage container, and vice versa. The best food for long term storage are the foods that best resist rot. Food with low moisture content is the best for rot resistance, and those include beans, flours, grains, dried fruit, milk powder, and jerky. There are many other foods that store well, and as a prepper you will want to consider calories, protein, and nutrients. 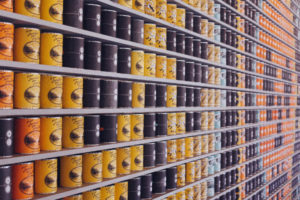 We list some containers below that come with food, so be sure to know the shelf life of what you are getting, the nutritional content, and the calories. It is best to keep an inventory of what you store so you can know when to cycle out expired or older items and replace them. 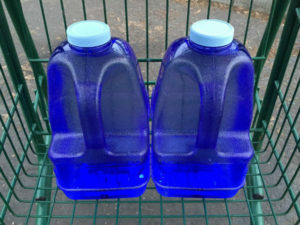 Plastic Bottles: With a little bit of cellophane, you can turn a two liter bottle into a great way to store rice, beans, sugar, or other pourable items. You will just need to make sure it is clean and thoroughly dry. Wash out the inside with dish soap and hot water. Add a few drops of bleach and then rinse it out and set it out to dry. Check that it is truly PET plastic by checking for the small PET triangle on the bottom of the bottle. When you fill it, put in an oxygen absorber half way up to help improve the shelf life even further. Two liter bottles hold a fair amount of food and are not as heavy as a five gallon bucket, which can make them easier to handle. Tupperware: Sealable plastic bins have changed the world. If you are prepping food for your weekly meals, or transporting food to a friend’s house, plastic storage bins can get the job done. They are dirt cheap these days and are very easy to use. While they can leach, stain, and scratch, as long as you use it for short term storage as intended they are nearly unbeatable. While all plastic will eventually leach into the food product, if you cycle what you are storing out at least every six months, it should not be a problem. Plastic containers are great because they do not break as easily as glass, are cheap, and are reusable. If the plastic containers you are using are clear, it is best to store them in a dark closet or room so the light will not degrade your food storage. Mason jars are versatile glass jars that are widely available and commonly used for food storage. They have been used for over a century, so you know they are tried and true. You can store dry goods in mason jars or you use them for canning. To use them for dry storage, just load it up with the rice, beans, sugar, or whatever you are storing up to about ½ and inch from the top and then put in an oxygen absorber. Always use a new lid when you store food in a mason jar so you can get a good seal. Put the lid in hot water to soften the seal ring. Then pull it out and thoroughly dry it and screw it down tight on your jar. Using jars for canning is a whole process on it’s own. If you are interested to learn how to preserve food using canning, you should pick up the Complete Book of Home Preserving, the highest rated canning book on Amazon. You will want to store mason jars in a dark closet, since the jars are clear and do not block light. Use sturdy shelves when storing mason jars because the weight can add up very quickly. If you use wooden shelves, you can make your mason jar storage more secure by tacking a strip to the front of your shelves to create a lip. Even if you are not in an area that sees earthquakes often, it is best to be safe with your food storage. You don’t want to create an avalanche of mason jars on accident, and the lip can help prevent this. As another precaution to prevent broken mason jars everywhere, it is always better to build more shelves than to stack mason jars- don’t rely on those slippery glass bottoms! If you can find a local cannery, you may be able to get the best variety for cheaper than the online sources. You will also have the opportunity to make connections, ask questions, and know exactly what is going in your stores. These are not your typical 5 gallon buckets from the Home Depot. Food grade buckets are made of a different type of plastic to prevent leaching. They cost a little more than your typical buckets, but are worth it for the added safety and flavor of your food. Food storage buckets should be made with high density polyethylene without BPAs, and be manufactured to meet NMFC, FDA, and UFC requirements. A bucket could have the triangle on the bottom with the number two and the HDPE mark, but not be food grade. This could be due to the construction method, not being able to provide a secure seal, made of reused materials, or even reused themselves after chemicals or paint. HDPE buckets are still porous, and can absorb chemicals stored in it. Make sure that you purchase from a reliable source so you don’t get duped. If you do decide to get used buckets, make sure they have only been used to store food and be prepared to clean them thoroughly. A rubber mallet is a great tool to have to seal food grade buckets. Place the lid in its place on the filled bucket, and whack the lid into place around the perimeter of the lid. Once you have secured the lid, you can test for a good seal by picking the bucket up by the lid. The weight of the food stored is a pretty good test for whether the lid is securely attached. This option requires the least amount of work and time investment. You can stock up on these regular sized cans on each trip to the grocery store for one of the easiest ways to build a stocked pantry. Grocery cans range in size from 12 ounce cans to #2.5 cans, so you have different portion sizes to choose from. There is a big variety, they are widely available, and they are cheap- so they naturally are a good choice for those looking to begin prepping. Canned meats, vegetables, and fruits are all great building blocks for a food stash. Check the labels for calories and nutritional value, and try to get high calorie cans as well as balanced variety of nutritional values. Some cans label multiple servings inside the same can, so you may need to do a little math to get the total values. Ready-to-eat canned foods are good to have around for small disasters since they are less of a hassle to prepare. You can concentrate on more important matters if you just heat and pop open a can of soup or chili. 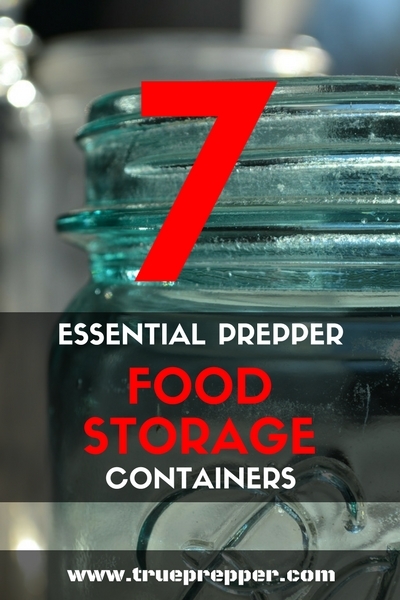 Food storage should be an integral part of any prepper’s contingency plans. The best prepper food storage containers should not be overlooked if you want your food stores to last. Storing your food in the right containers can give you peace of mind when it comes to your family’s sustenance. If you are starting from scratch, start small and work your way up. I personally prefer to rotate out my pantry using the first in, first out (FIFO) inventory technique. This ensures that I don’t have much food expire (if any) and gives me good visibility of what I actually have stored. Whether you stash your food for 15 years, or rotate your supply every 6 months- the right prepper food storage containers can give you a leg up with your shelf life. Keep exploring, stay prepared, and be safe.